Burlington City Council President Jane Knodell recruited and paid a fellow councilor $2,000 to run her reelection campaign. Knodell (P-Central District) made the one-time payment on January 30 to Cobble Knoll — an LLC registered with the state three weeks earlier by Councilor Adam Roof (I-Ward 8). Both Knodell and Roof asserted that the relationship does not involve any conflict of interest. And Roof said he is also doing paid work for incumbent Joan Shannon (D-South District) and political newcomer Richard Deane, a Democrat who's running for a council seat in the East District. Neither Shannon nor Deane reported payments to Roof in their campaign finance filings, though Roof said he has not yet billed them. Shannon said she would pay Roof $1,000 for his work. Deane did not immediately respond to requests for comment. 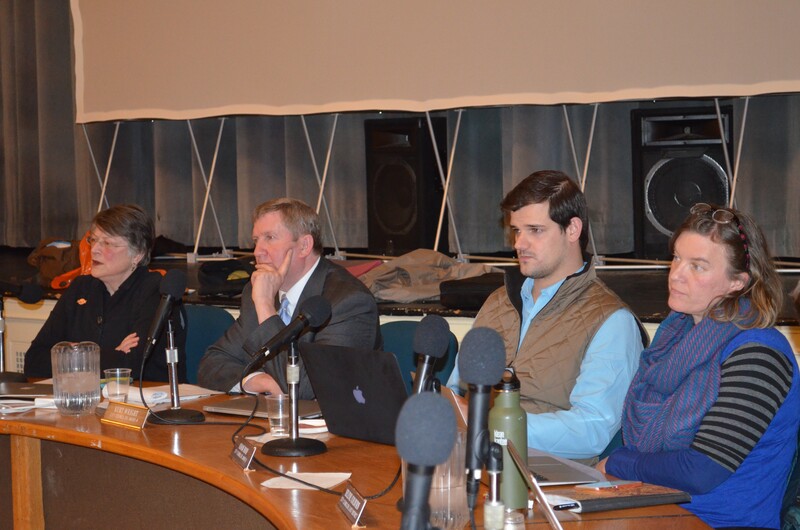 Middlebury-based ethics expert Mike Palmer said such business relationships involving councilors could raise questions of real or perceived impropriety — whether "the judgment and decisions of the government official [are] unaffected by any interests other than that of the city." Palmer is a lawyer and owner of the consulting and training business Ethics by Design. Knodell faces a challenge from Genese Grill. The incumbent has raised $7,715 and spent $4,184 — about half of which has gone to pay Roof for his services. Roof said the job entails social media work, coordinating volunteers, communications strategy and budget management. He earns his living as a political organizer and consultant for candidates, he said, though he noted that this is the first time he's ever run a Burlington campaign. Among city councilors, Roof said, his work for Knodell is "no secret." "It's a couple thousand bucks," he said. "It isn't going to impact how I vote." Roof left his full-time job at the National Center for Campus Public Safety in August. He spent much of the summer and fall advocating for two ballot items involving the Burlington Town Center redevelopment. Both passed in November. He worked for a candidate in Virginia and is now trying to get more experience consulting for campaigns, he said. "I want to be clear: they came to me, I didn't go seeking out this work," Roof said. "Folks recognize my ability and prowess in community organizing." Knodell, a University of Vermont economics professor, contributed $250 to Roof's 2015 campaign, when he won election. One of her students at the time helped run Roof's campaign. If reelected, Knodell indicated that she plans to seek a third year as city council president. Roof voted for Knodell in two previous council president elections. If the vote comes around this year, Roof said he sees no need to recuse himself. "I'll consider voting for Jane on the grounds of whether she's the best person for the presidency job," Roof said. "Any notion that Jane is paying me for a vote to be president — that's absurd." And when controversial resolutions come to a council vote, Roof said, the payment from a fellow councilor would neither change his allegiance nor cloud his judgment. "That it would make me any less of an independent, I consider absurd, and I just patently disagree with it," Roof said. The work, he added, "is a great opportunity to support people I believe in." According to Burlington city attorney Eileen Blackwood, Roof's work on fellow councilors' campaigns doesn't create any conflict of interest that would violate city policy. The rules on the books only speak to instances when a city councilor has a "direct financial interest" in the outcome of a vote, Blackwood said. The issue could potentially fall under the purview of a city ethics policy, she said— though one doesn't exist in Burlington. "Every councilor, when a particular matter comes before them, makes a decision of whether they can exercise independent judgment," Blackwood said. The issue does raise questions of ethics and alliances, according to Palmer. Palmer had never heard of a similar case, and most likely, he surmised, "the people involved haven't thought of" potential issues that could arise from the situation. Nevertheless, Palmer highlighted the need to closely examine potential conflicts within local government. "People form alliances or caucuses all the time," he said. The question that arises he added, is whether "the fact that [Roof is] getting paid, in some way compromises his independent judgement with respect to issues that come before the council." Grill, who is running as an independent against Knodell, voiced concerns that councilors are "vigorously promoting the same political agenda." "For one city councilor to take money from another city councilor for any reason is questionable," Grill wrote in an email to Seven Days. "To take money to promote her political campaign is particularly troubling." According to Palmer, how things look is a concern. "One of the considerations is the appearance of impropriety — how other people might see the conduct in question — as well as the actual impropriety itself," Palmer wrote in a follow-up email to Seven Days. Palmer offered an imaginary scenario of a council member who hires other councilors, but uses the payment for work as a pretext to earn their loyalty. "You can easily imagine scenarios that would be much more nefarious than this likely is," Palmer said. It highlights "one reason we need a good government ethics program." Shannon, though, argued that paying Roof for his campaign work is a way to mitigate any conflict of interest. "He sends an invoice; we pay it. Done," she said. "There is no more expected from either side." Shannon said she feels more indebted to campaign volunteers who turn out in the snow and the rain to do literature drops. "Councilors regularly help other councilors in their campaigns," she said. "Most of it doesn't have to be reported. No one reports who's putting in 100 hours of effort." For her part, Knodell called any assertion of a conflict of interest "a baseless, groundless suggestion." She "was shocked" the issue even came up, she said. On the council, she added, "When we have a conflict, we disclose them. I don't think that's the case here." Other councilors are supporting Knodell's campaign as well, she pointed out — though on a volunteer basis. "I've known Adam since he was an undergraduate at UVM. I have a high level of trust in him," she said. With her work as a researcher and professor, she couldn't take on the task of running her campaign herself. "I have a very active opponent and I was looking for someone who had the skills" to run the campaign, Knodell said. "The work was beyond what someone could be expected to volunteer."